We have just had the opportunity to take advantage of an airline sale and get my parents and my sister and family together in Sydney for three days in May for the first time in over 8 years. It also coincided with our 26th anniversary, so we chose to head by train into the Blue Mountains to do some birding for a week and get some exercise on all of the hiking trails. Of course we had to dig out all of our winter clothes, which rarely get used and chose to take a heated cabin rather than use our tent due to the wintry conditions. The changing leaves on many of the trees made for a beautiful landscape and the inclement weather rarely distracted us from going out all day……wrapped up. Thank goodness for fingerless gloves when you are trying to focus your binoculars or take photographs in freezing conditions! It must seem odd that I am talking about the cold as you warm up in the northern hemisphere, but we are now back in the warm tropics at home in Broome and the winter clothes are packed away once again. 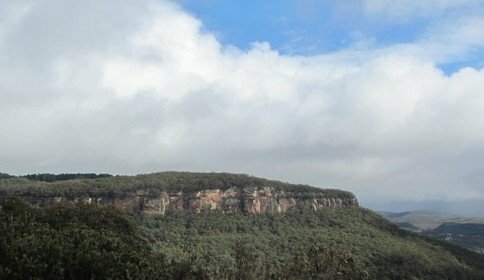 We spent our week in the Blue Mountains staying in Blackheath and then using that as our base to explore the Blue Mountains trails in Katoomba, Leura, Wentworth Falls, Mount Victoria and around Blackheath. The train service is efficient and picturesque and we used it every day to get around. Our decision to pack a thermos flask, which rarely gets used, was the best decision ever! It was used every day for a hot drink for lunch wherever we happened to be. The waterproof covers provided with our backpacks were also very useful on several occasions and layering of clothes was important. 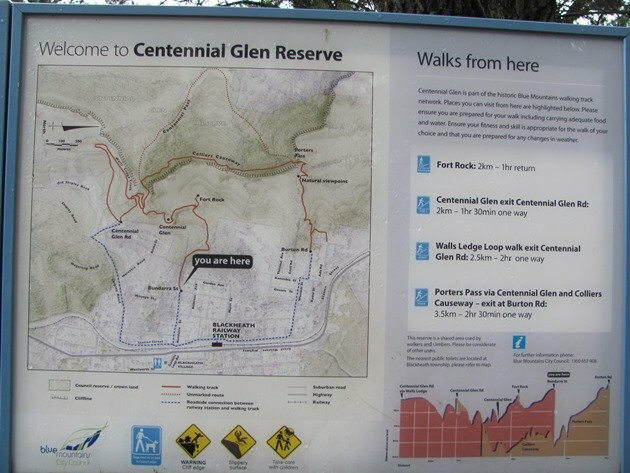 We spent one day hiking from Blackheath on the Centennial Glen Reserve and included the trails through Centennial Glen, Walls Ledge Track, Colliers Causeway and Porter’s Pass. These could be done as shorter walks over several days if time was available, but we had so many walks we wanted to do we did walk all day most days. Much of the track is steep or damp and care does need to be taken and as such it is quite slow going, especially if you are birding! It is well signposted and the timings are fairly accurate if you don’t stop to observe the birdlife! 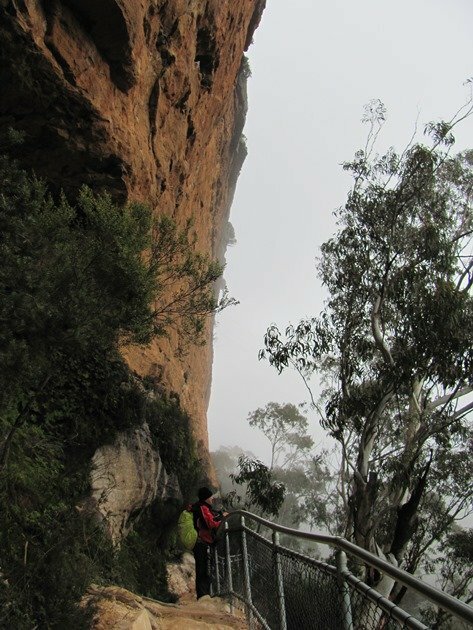 The weather was very changeable and we would soon be surrounded by mist and clouds and we were prepared for all outcomes and it made for some spectacular views. 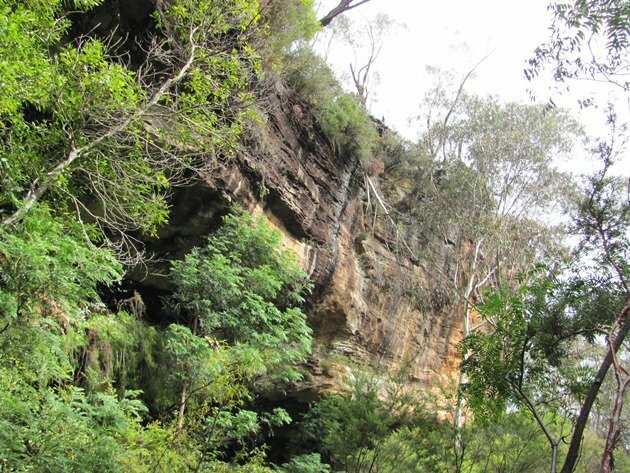 The cliff walls were covered in plant life and this is also a popular spot for those people interested in climbing rock faces. There are bolts in place in some areas and it appears that it is controversial that climbing is allowed in the area. We saw very few people participating in the sport during our visit, but it was mid-week and the weather was being temperamental. We had mainly seen Red Wattlebirds, Little Wattlebirds, Eastern Spinebills, Crimson Rosella, Eastern Whipbirds and Laughing Kookaburras as we descended and we then suddenly encountered flocks of birds on the move. They were mainly White-naped Honeyeaters, Yellow-faced Honeyeaters, Silvereyes and Striated Thornbills with the occasional White-eared Honeyeater. 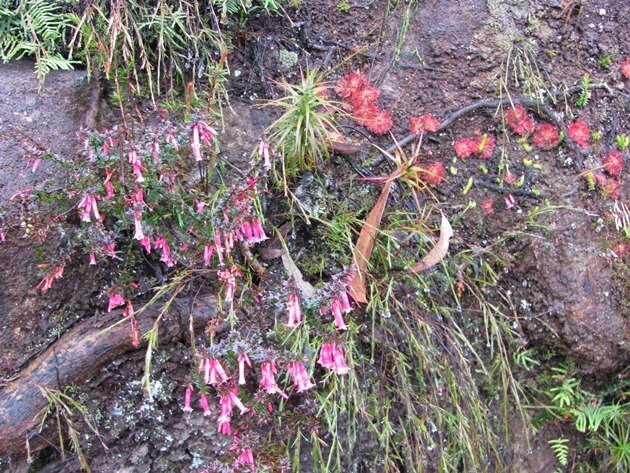 There were White-browed Scrubwrens in the damp gully and we soon had to face the climb back out up Porter’s Pass. 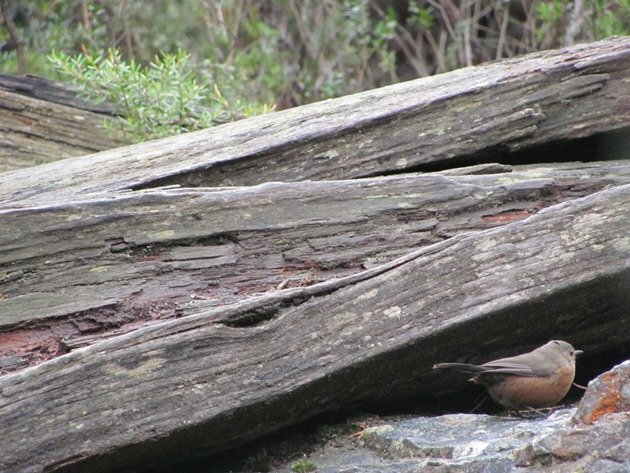 We had had our first encounter with a Rock Warbler on a hike from Katoomba to Leura, but due to taking too much time observing the “lifer” we had not been able to obtain a photograph. We were hopeful of another encounter and this was the spot! We were climbing up a steep section with stone steps and I was in front when a Rock Warbler suddenly appeared on the stone steps and hopped ahead. I was quick with removing the camera from its pouch this time! It hopped ahead and I followed with Grant close behind….reminding me that I really should not get another photograph that could go on the “diabolical” page. I got to the next ledge just behind the Rock Warbler and it gave me one brief chance to photograph it. 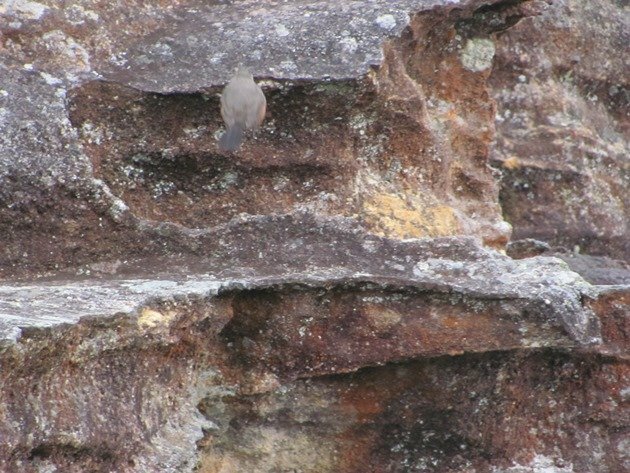 It was not the best photograph of a Rock Warbler, but it was a photograph and it was a “lifer” and it is endemic to New South Wales. 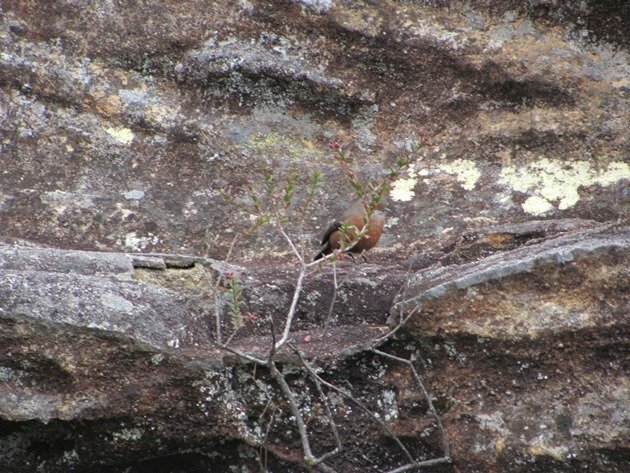 We carried on climbing and before long we were at another rocky outcrop and what should be there, but our Rock Warbler! We knew it had gone ahead, but didn’t know it was keeping on our track! I took a photograph quickly and then attempted to get closer. 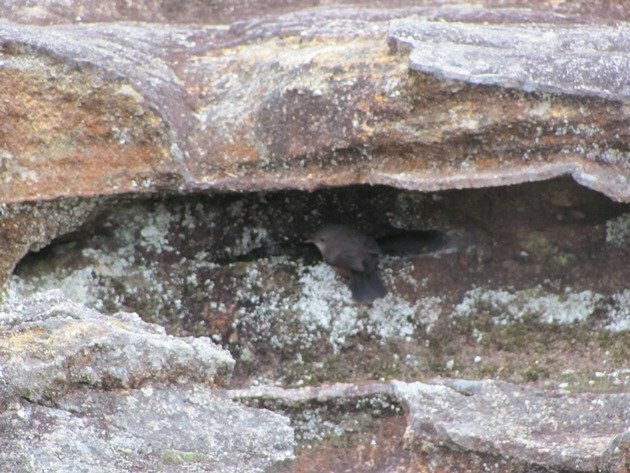 The bird was very agile amongst the rocks and went in and out of caves and searched frantically for food. 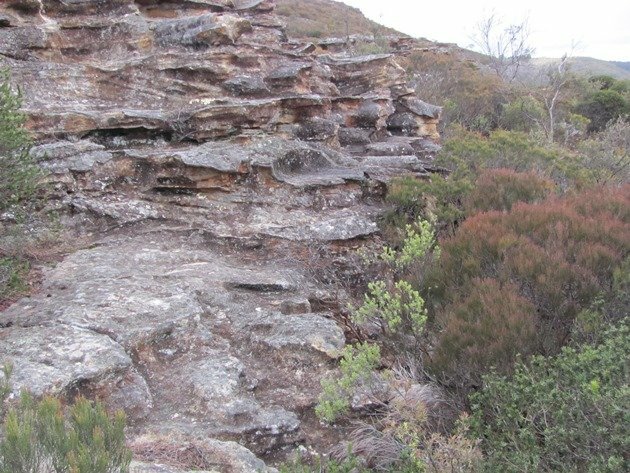 If you get a chance to explore the Blue Mountains then we would definitely recommend it for birding and hiking and this time of year may be cold, but the trails are quiet and we rarely encountered other people. are those little red rosettes in the plant photo sundews? looks a lovely spot. Yes, they are sundews! Great spot for hiking and birding if you ever get a chance. What a glorious hike, and a sweet little well-named and well-camouflaged Rock Warbler! That landscape? No way!!!!!! How cool are those cliffs?! 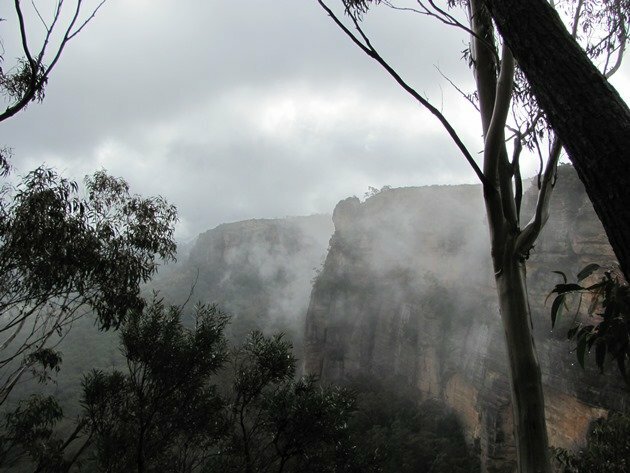 Put the Blue Mountains on your list of places to visit! Bring a few Wallcreepers with you! Hope you and your birds are OK in the Europe floods we are hearing about. Needless to say I dipped on this species again on my brief trip to Sydney. But I did manage to find a lot of lyrebirds. Lyrebirds are great! Our best day got us 9 at Springwood on a day trip to the Blue Mountains last year and that’s just the ones we saw! They are great at being vocal! Good Luck for Rock Warbler on your next trip! 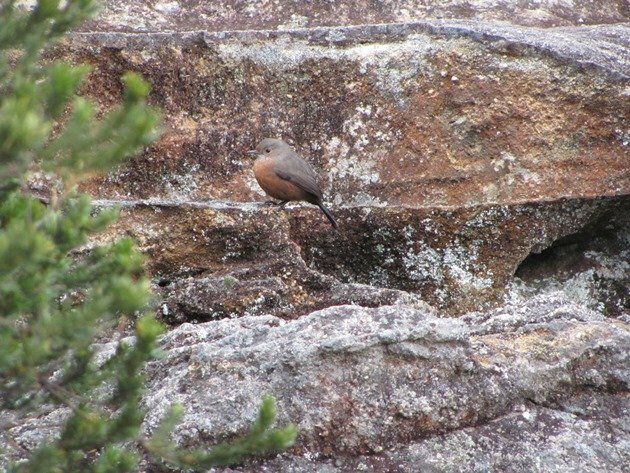 The Rock Warbler I saw when I visited Australia didn’t let me take its picture at all. I did enjoy seeing it though. I enjoyed my two days in the Blue Mountains as well. Your posts are really good at making me want to return to Australia. Either they remind me of places I went and would like to go back to or they remind me how much more there is that I didn’t get to see. Thanks, Katrina…hope you get back to Australia soon!